A Columbian mammoth, which existed in North America until 11,000 years ago. The Columbian mammoth is one of over 100 large herbivores and carnivores that went extinct as modern humans spread around the world. Large animals are particularly important in shaping the structure and function of ecosystems. 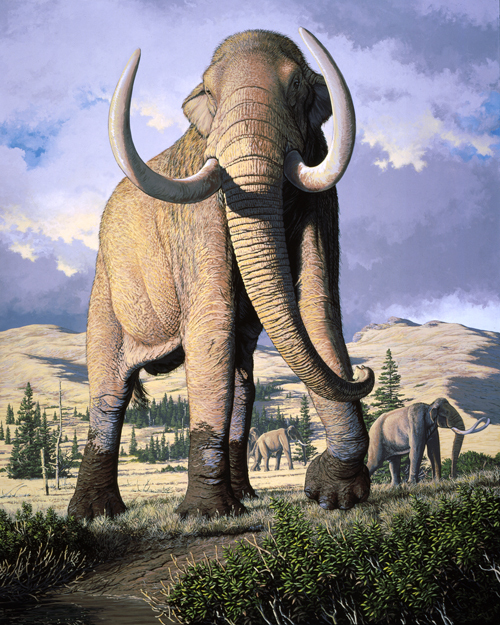 Cover image of PNAS courtesy of Carl Buell, with the original on display at The Mammoth Site, Hot Springs, South Dakota. This week sees the publication of two special features, in Proceedings of the National Academy of Sciences and Ecography with 24 papers examining how megafauna affect ecosystem and Earth System function. This topic is based on a conference we held on Oxford in March 2014, and features on the cover of both journals. In almost all land regions the decline and disappearance of these large animals, the megafauna, has been associated with the sudden arrival of modern humans, with only Africa and southern Asia, with a longer human prehistory, having pockets of substantial remaining megafauna. We live in the shadows of lost giants. Until relatively recently almost every major vegetated land area on Earth possessed an abundance of large animals that we now only associate with African game parks. Mesmerizing early art shows how much these giant creatures dominated the psyche of our ancestors. They included larger relatives of familiar creatures such as elephants and lions, but also exotic wonders such as giant sloths, car-sized glyptodonts in the Americas, rhino-sized marsupials in Australia, and gorilla-sized lemurs in Madagascar. The oceans also hosted a high abundance of giants, which linger on in greatly reduced populations after the advent of commercial whaling. Over the last 50,000 years, a blink of an eye in geological and evolutionary time, something extraordinary happened. These giants have disappeared completely from many continents, and been greatly reduced in diversity, abundance and range in other continents. In almost all land regions the decline and disappearance of these large animals, the megafauna, has been associated with the sudden arrival of modern humans, with only Africa and southern Asia, with a longer human prehistory, having pockets of substantial remaining megafauna. The evidence of strong decline is earliest in Europe and Asia, but most dramatic in Australia, the Americas and islands such as Madagascar and New Zealand. Much has been written about the size and cause of this decline, but much less on its consequences on the broader environment. Too little of our thinking about contemporary ecosystems, whether marine or terrestrial, reflects that these are ecosystems missing a major functional component with which they co-evolved. It is likely that there are many “ghosts” of the megafauna in the structure and function of the contemporary biosphere. When we wander out into the closed woodlands of, say, Europe or North America, the woody savannas of South America or the fire-dominated drylands of Australia, it is worth reflecting on the elephants or other giants that were there just recently, and how even the most apparently pristine ecosystems may still resound with the echoes of their absence. In March 2014, we convened a major international workshop at St John's College Oxford, supported by the Oxford Martin School, and gathered a large number of international experts from disciplines ranging from paleoecology and anthropology through to conservation science and policy . The workshop was the first international meeting focused on the impacts of megafauna and megafaunal loss. It started by looking at the causes and impacts of past megafaunal loss, and then moved on to looking at contemporary studies around the world, ranging from work in savannas of Africa to 'megafaunal rewilding' experiments in Europe and Russia. Finally it examined the challenge on ongoing loss of megafauna, and explored the potential and consequences for bringing back megafauna in selected landscapes, and what it means for conservation thinking and science. The proceeding of the conference have led to two special features in scientific journals, which were published on January 26th 2016. Ten papers are published in Proceedings of the National Academy of Sciences, and 14 in Ecography. Collectively, the studies show emphatically the large impact that megafauna have on various aspects of the environment, ranging from vegetation structure and composition, species composition, through fire patterns, soil fertility and nutrient flow in both land and oceans, and even regional and global climate by affecting land surface reflectivity and atmospheric methane concentrations. The loss of megafauna cascades through all levels of functioning of ecosystems. Even the apparently wildest contemporary landscapes likely carry the legacies of lost megafauna, and the consequences of contemporary decline of elephants and other megafauna may be felt for centuries or millennia to come. This improved understanding of the many ways that megafauna have influenced ecology and biogeochemistry may also help identify hitherto underappreciated and unidentified 'ecosystem services' that our planet's remaining giants provide – or could provide if megafaunas were allowed to recover. Taking the latter perspective, the special features conclude by looking forwards, and exploring the potential of a 'megafaunal rewilding' agenda to shape how with think about nature conservation, and how we maximize landscape vitality and resilience in the changing and pressured environments of the Anthropocene. Much of the world is still suffering ongoing loss of its remaining wild large animals, often even within protected areas, as illustrated by dramatic and urgent rhino and elephant poaching crisis in Africa. However, in some regions a new dynamic is taking place, where megafaunas are undergoing unprecedented recoveries. These involve spontaneous recolonizations in response to societal changes, e.g., the return of wolves to Western Europe in recent years. It, however, also includes an increasing number of megafauna reintroductions, not just to aimed at restoring these magnificent species, but also their ecological effects. We need to understand how best to implement rewilding in the human-made landscapes that increasingly cover the Earth and its functionality in such settings. It is important think practically about how to develop strategies for implementing rewilding in ways that will allow it to realize its potential transformative role for nature conservation in the 21st century. The ghosts of the past megafauna may still have lessons for how to maintain life on a human-dominated planet.